I love the written word. Ever since I was nine years old I knew that I wanted to write. I still remember the first real novel I ever read, and the impact that novel still has over my life. Somehow, life, love, and discontentment squeezed itself in between the coils of Gods purpose for my existence. I buried my dreams. Whatever the case, it doesnt matter anymore. What is important is that I am here now and oh how happy I am to be exactly where I am, introducing myself to you. I commit to the integrity of my thoughts soulfully arranged on paper. I know this is the first you may have heard of me, but it won’t be the last. This is my dream, not to write poetry, but to tell stories. Stories that bruise, scab over, and finally heal as though there was never a bruise. There were so many nights I lie awake crying and thinking about what it really meant to be a woman, a mother, a sister, a daughter, a member of society, and most importantly a child of God. I thought it was insomnia (smile), but it was purpose calling out to me. Finally, I put pen to paper and I let my fingers tap incessantly across my keyboard until the joy and pain within poured out of my spirit. I offer to you my stories in the form of poetry & prose. This is The Truth A I See It. Please enjoy. Nakia R. Laushaul is currently employed as a Finance Administrator. She is a poet, novelist, and inspirational blogger. In her free time, she enjoys performing her poetry and hanging out with her teenage son. Nakia serves on the Board of Directors for a non-profit, KCCP, purposed to encourage arts participation in youth. Nakia is committed to challenging everyone in her reach to find compassion and empathy in the differences that exist among us all. The God in me makes me feel powerful. I have overcome so many obstacles in my life that tried, yet failed each time to break me. I woke up one day and felt like yeah I finally got this, I got me. I am no longer ashamed of where I come from, who I am, what I lack, what I have, or where I’m going. 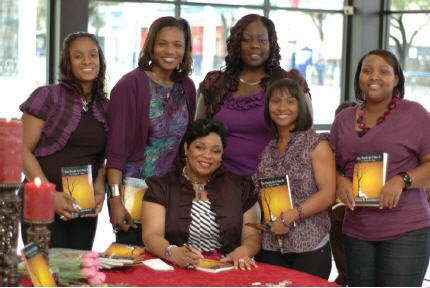 All I know is that I am writing with the authority of God and that makes me a powerful woman. My hope is to inspire generations to come. I want future readers to know— if you follow the hollow ground I’ve walked on, it will take you generations to be free. Learn from the past and take the shortcut, young one — here, take this shortcut. BPM: Introduce us to your book of poetry, The Truth As I See It. My book is called, The Truth As I See It: In Poetry & Prose. It’s an inspirational collection of poetry and essays about everyday life from my point of view. Although I absolutely love poetry, I am a storyteller to the depths of my soul. Therefore, you will see a complete story in every poem. Every chapter tells a poetic story about You and Me, Love, God, Life, and how I came to be free in a way that every reader, no matter their favorite genre, will enjoy. I have been (and still am) working on a novel for many years. I won’t even tell you exactly how many years it has been, not just yet (smile). All those years, I was afraid to write because I feared what I would come out of my pen and the impact it would have on others. I knew that whatever I wrote would be so drenched in truth that some people were bound to get their feelings hurt. In the process of avoiding what I was born to do, I was disobedient to God’s purpose, and my life was a mess. I woke up before dawn one day feeling distressed because God fills my head with so many thoughts, I don’t sleep well. I found underneath my desk, a beautiful journal that I had never opened. Inside was an inscription by Picasso that read, “Everything you can imagine is real.” I wrote underneath, Then I imagine I love myself. I turned the page and wrote down all the reasons I loved myself. Those reasons turned into the first poem I wrote for this collection, “I Am A Tree.” By that evening, I had a title for the entire book, The Truth As I See It. It was all poetry in the beginning, but I was hooked on blogging; hence, prose entered the book. BPM: Whom do you want to reach with your message in The Truth As I See It? I wrote a poem that deals with what will surely happen to our future if we don’t do something called, “Deuteronomy.” Many of my messages are a bit taboo and I wrestled intensely with writing them, but either I stand up for what I believe in, or I should have called my book, The Lies I Tell Myself. That was not going to happen because I’m done with lying to myself just to make someone else feel comfortable. BPM: How will reading your book shape the readers lives? When my readers put my book down, I want them to imagine me saying personally to them, “You are strong, you are beautiful, you can make it, and you are uniquely fashioned in His image. You are A Tree!” I want my readers to concentrate more on being who they are and not what others want them to be. I would like them to feel empowered enough to break away from generational curses and self-defeat, find their purpose, and truly live. BPM: What was the most powerful poem in The Truth As I See It? I cannot pick a most powerful poem as each one tells a story that is special to me. I would very much appreciate if my readers would send me an email letting me know which poem affected them the most and why. On the other hand, my novel, Running From Solace is my baby waiting patiently to get here. I can’t wait to hear your thoughts on the excerpt I included at the end of The Truth As I See It. Ecclesiastes 1:9 What has been will be again, what has been done will be done again; there is nothing new under the sun. Since there is nothing new to be done, the only difference between my book and others’ is the way I choose to offer my poetic stories. I give them in a page turning, here’s the truth, now deal with it—plain and simple sort of way. You will not need a decoder to decipher the message because I give it straight up—no chaser, so be ready. 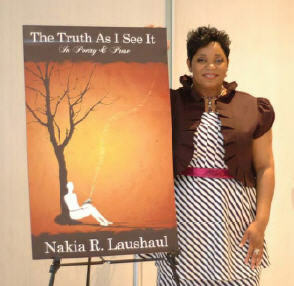 Presently, you can purchase and autographed copy of The Truth As I See It: In Poetry & Prose on my website. It will soon be available online at Amazon, Barnes & Noble, and through other Internet sources where books are sold. I am currently working on my novel, Running From Solace. I am a real life Social Butterfly, so I welcome you to rant it up with me on my blog, Random Rants of Truth of a Social Butterfly: http://nakialaushaul.blogspot.com/. Friend me and get chatty on FaceBook, or stop by my website anytime you like to see what I’m up to and what’s new: http://www.nakiarlaushaul.com/. Go on YouTube: http://www.youtube.com/watch?v=vq5T85tMQ68 and check out a hip rendition of one of my poems, “Brink of Submission.” I also welcome your emails, so share your thoughts about my work: Nakia@nakiarlaushaul.com. Please Tweet about this article, repost and share at Facebook and tell all ya friends about The Truth As I See It. Thanks! ~ by blacklitmedia on June 11, 2010. Right now it looks like WordPress may be the recommended running a blog program available at this time. (from exactly what I’ve read) Is usually which precisely what you’re using on your own website? Great write-up nonetheless My spouse and i ended up being asking yourself when you could possibly create any litte far more within this theme? My Freind’s blog is amusing product review.